The City of Chestermere is in the process of budget consultations. They’ve creatively used the image of a baked pie to ask for our input on how our limited tax dollars should be spent across the various services our city offers. Should we spend more on emergency services? On parks? On governance? It’s an excellent way to get our community talking about our services and I hope everyone has offered their thoughts using their online tool. Cities work with limited resources to offer maximum services. The pie, in this sense, is finite. There is only so much to go around. But there is another pie that is not finite, in fact it is ever expanding. It is the quality of our contribution to our city and neighbourhoods. We do not merely view ourselves as residents, or consumers, of Chestermere’s limited tax-funded services. We are neighbours working together in caring ways to do what a city budget never could do. Community & Social Development – Community non-profits thrive when the community gets involved. From volunteering, to hosting events, to joining workshops or assisting with fundraisers. Chestermere has very few non-profits and a small network of people carrying on good programs. By reaching out and encouraging them along, and joining in, we all benefit. Parks & Recreation – While it takes a budget to care for our parks, it takes a community to keep our city beautiful. Many of the green spaces in Chestermere belongs to private residents; and people may who choose to maintain their yard or abandon it. When neighbours decide to plant more trees, mow overgrown grass, tend to weeds, and clean up garbage, we will greatly contribute to the beauty of our city. Policing & Enforcement – Neighbours play a vital role in keeping our communities safe. Studies show that in neighbourhoods where people know each other, crime rates are lower. When we look out for each other, our police are able to respond quickly and criminals learn that our city is a tight knit community that might not be worth the effort. Planning & Development – Cities are only built once, and we have the honour of designing and building Chestermere for the very first time. 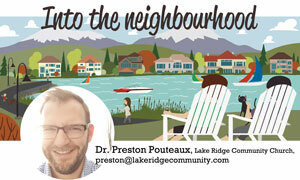 Neighbours have a strong role to play in how we plan our city. When the community comes together to advocate for better neighbourhood design and more creative planning that serves our city well, we set up our city for success. Share your ideas, they matter. We do not have a limit to the quantity and the quality of care we give to our city. Author John McKnight says that the glue that holds a community together is the care and trust we foster. You have a part to play beyond setting the budget. You actually help to make this community worth sustaining. We’re deciding more than a budget, we’re deciding on the kind of community we’ll be.